The workforce solutions industry is likely one of the most fast-paced and challenging out there. Managing client, prospective and current candidate relationships, and driving new business all require high energy levels and a strong marketing strategy. As in every other industry, digital marketing has made its impact on this world. Research by Social Content shows that more than 37% of their respondents rely on social media as a source for finding candidates. And rightly so, social is cheaper than a newspaper advert, and the probability that your social post will get more reach is far higher, as caring friends tag potentials that might be in the market for your advertized role. But are recruitment process outsourcing firms getting the most out of digital? 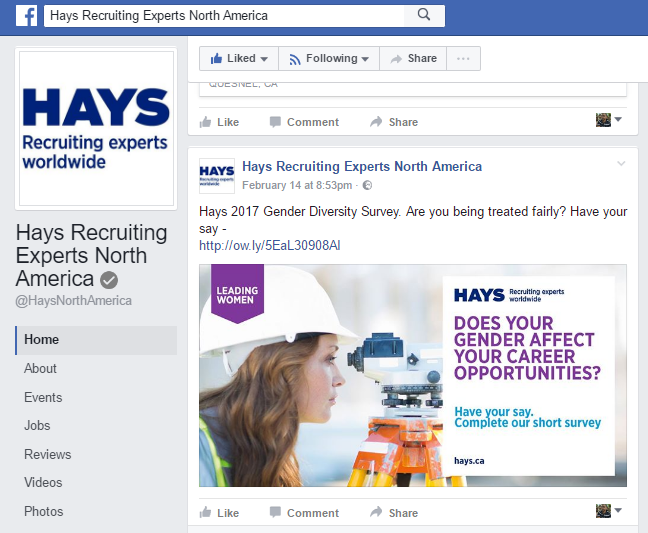 Are they making the most of social as a platform for brand growth as they try to find and place the right candidates? In this blog post, we’re going to look at digital marketing tips for workforce solutions providers. These are tips that can help you get the most out of your digital presence and build a stronger online brand. Without further ado, here we go. To make your mark and create a lasting impression that will open the door to that highly lucrative, multi-year RPO contract, you need to create an online presence that sets your brand apart from all others. One of the best ways to do this online is by sharing great content. Great content is useful content, content that makes readers feel like they gained something valuable from taking the time to experience it. Great content can therefore help you distinguish your brand from the rest. Prospective candidates are looking for opportunities that are a step up from what they are currently experiencing. To find the best kind of opportunities, candidates are going to search using keywords about the roles they are considering. This means that you can create content that puts your brand on their radar. It may not look like there’s much to infer, but here’s where digital marketing gets interesting. The terms above show what prospective engineering candidates are looking for. 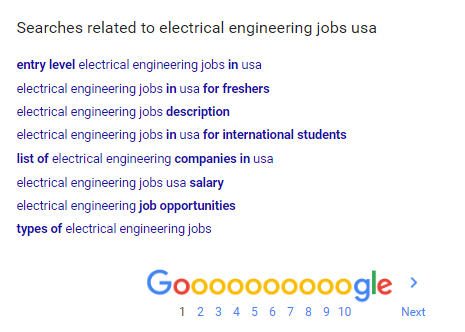 If your agency specializes in placing electrical engineers in the US, you have the opportunity to capitalize on these search terms by creating content that attracts candidates using these exact search terms. Some of the best workforce solutions websites get this right by creating troves of content that their audience flocks to. For our electrical engineering example, your goal is to create content that electrical engineers would find useful. This useful content introduces your brand to candidates. As part of your inbound strategy for driving more candidate signups, you could then make an offer at the end of each piece of content for the candidate to join your recruitment firm for placement opportunities, or to keep up with what’s happening in the electrical engineering recruitment world. Creating content related to the search terms your audience is using is also valuable to your long-term digital marketing strategy. As more people find your content useful, more people will link to and share it. Your agency will be the place where interns and seasoned professionals flock to for timely, valuable advice (and placement opportunities) and a unique perspective on the job market in their industry. The second part of our marketing tips for staffing solutions providers is all about making the right moves with your content on social media. Social is where your firm really needs to shine. In Hootsuite’s Digital in 2017 Global Overview, they share some pretty endearing statistics about social media and mobile data across the globe. According to their research, social media has seen a rise of 21% in active users since July 2016. That’s more than 482 million more active users. This undoubtedly shows that there is a captive audience for recruiters to engage on social media. But making social work for your firm will take some creativity. 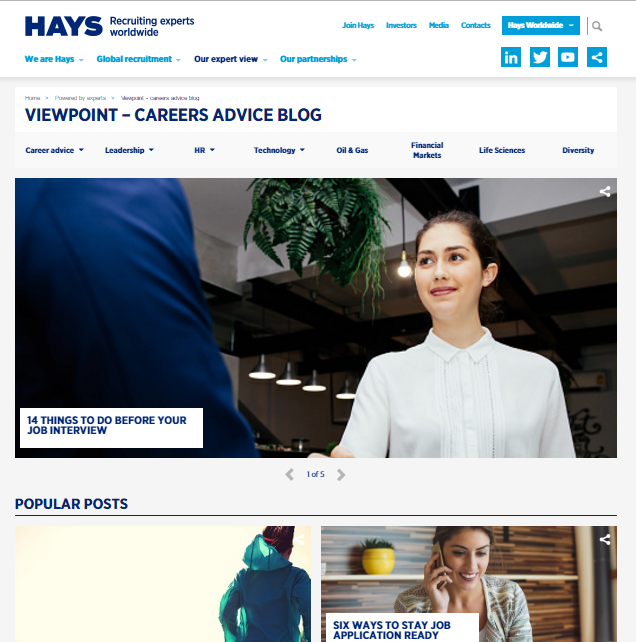 Using LinkedIn, Twitter, Facebook and YouTube, Hays publishes everything from free salary guides and video case studies, to helpful articles and surveys. How does this information help my persona? What does this information help my persona do? Answering these questions will help you create content that your audience assigns a high value to, and also increases your audience's perceived value of your brand. Create a social post schedule to carry your content for the next couple of weeks. On your schedule, create at least three unique posts that a relevant to the content you’ve produced. For example, if you’ve just released a survey on salaries for electrical engineers across the US, one of your social posts could quote a statistic from the survey. Another post could quote respondent. These kinds of posts make your content more appealing to readers and therefore more likely to elicit more engagement that just sharing the copy as before. Make sure all social posts have different but relevant images. Research shows that Facebook posts with images receive 87% all engagements. Relevant and unique images are therefore more appealing and also remove the likelihood of your social posts experiencing fatigue. Successful digital marketing relies on more than one practice. To get results, you need to plan, execute consistently, measure and repeat. The marketing tips for staffing solutions providers above are just two of many that can get results if applied consistently.